Mix the dry ingredients in one bowl, and then stir together banana, egg, mill and vanilla in another bowl. Add the wet ingredients to the dry and stir until just combined. Cook in your waffle iron for a few minutes, until done. If you want to freeze them for later, place them to cool on a rack, then freeze separately before sticking them in a ziplock bag. Then, just re-heat in a toaster! Yum! Would this batter work in the heart shaped wafflemakers or is it meant for a belgian wafflemaker? They sound SO good but look a bit thicker than a Scandinavian waffle. Titus is getting SO big! Aimee, I know! 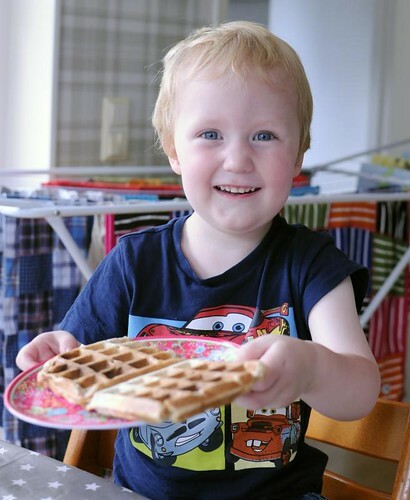 He's growing so fast :) I've only tried this with a belgian wafflemaker, since I finally got one. I think it's a little too thick to work well in Swedish style wafflemakers. But I'm sure you can thin out the batter to work in one of those, too.